FREMONT, CA -- American Portwell Technology, Inc., (www.portwell.com) a wholly owned subsidiary of Portwell, Inc., a world-leading innovator in the Industrial PC (IPC) market and a Premier member of the Intel® Internet of Things (IoT) Solutions Alliance, announces WEBS-5481, a high performance and low power intelligent Box PC. Powered by the 4th generation Intel® Core™ ULT (ultra low TDP) SoC (system on chip) processor (formerly codenamed Haswell), this system is an ideal fan-less controller for applications in digital signage, surveillance, image processing and machine automation industries. The Portwell WEBS-5481 is powerful but not power hungry; it utilizes the dual-core 4th generation Intel® Core™ processor with Intel® Turbo Boost Technology 2.0 (selected CPU SKUs), Intel® Hyper-Threading Technology and Enhanced Intel® SpeedStep® Technology. By adopting Intel’s SoC platform, which integrates CPU and PCH into a BGA package, WEBS-5481 is much smaller, sleeker and lighter compared to its previous generation. In addition, the elimination of the 2-chip platform enables a more effective thermal design for the WEBS-5481 intelligent Box PC. Thanks to the highly reliable chassis with a thermally-enhanced ripple fin design, WEBS-5481 can operate reliably in a temperature range from -20ºC to 55ºC. Plus, combining anti-vibration and shock resistance attributes, the fan-less and rugged WEBS-5481 excels in harsh environments. WEBS-5481 also offers clear and concise video and graphics capabilities that take full advantage of the 4th generation Intel® Core™ processor with integrated HD4400 graphics engine which outperforms its predecessor by over 20%. In addition to the built-in triple-display interfaces, two additional display devices are made available by Portwell’s graphics modules; thus, it can support up to five display outputs by extended mode in the OS. Product reliability and stability are definitely uncompromised; WEBS-5481 is rated IP40 and certified by industrial product quality tests, such as an anti-vibration test of up to 5Grms and an anti-shock test of 50G. Portwell’s WEBS-5481 has proven itself to be a perfect solution for video/graphics-demanding and automation control systems. The versatile WEBS-5481 system supports many other important features, including up to 16GB of DDR3L memory, triple display with DVI-D, HDMI and DisplayPort, 5.1-CH audio, and dual Intel® Gigabit Ethernet ports. It also offers rich compact I/O functions including 2 x SATA, 2 x USB 3.0, 2 x USB 2.0, 1 x 8bits GPIO and 6 x COM ports. To enhance system flexibility, customers can further augment functions per their specific needs via two antenna interfaces and an onboard SIM card holder for WiFi or 3G/GPS module, and two mini PCIe sockets for expansion; one or more PCIe expansion cassettes can be offered by counterparts of WEBS-5481 for hungry demand. Moreover, the WEBS-5481 also comes with a user-friendly design: the optional module can be installed or replaced easily and a wide range of DC power input, 12V~24V, is accepted so that it can not only prevent the system from damage due to power input change, but also expands the application fields of this Box PC to the automotive industry, for example. Last but not least, with wall and panel mounting design, the WEBS-5481 provides a slim and small footprint Box PC weighing only 2 Kg that can fit anywhere easily, no matter if it’s in the office or factory. 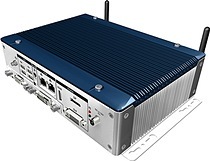 Product availability: In addition to American Portwell Technology, Inc., the Portwell WEBS-5481 high-performance low-power Box PC embedded system is also available through Arrow Electronics, Inc. and Avnet, Inc.
American Portwell Technology, Inc., is a world-leading innovator in the embedded computing market and a Premier member of the Intel® IoT Solutions Alliance. American Portwell Technology designs, manufactures and markets a complete range of PICMG computer boards, embedded computer boards and systems, rackmount systems and network appliances for both OEMs and ODMs. American Portwell is an ISO 9001:2008, ISO 13485:2003 and ISO 14001:2004 certified company. The company is located in Fremont, California. For more information about American Portwell’s extensive turnkey solutions and private-label branding service, call 1-877-APT-8899, email info@portwell.com or visit us at www.portwell.com.